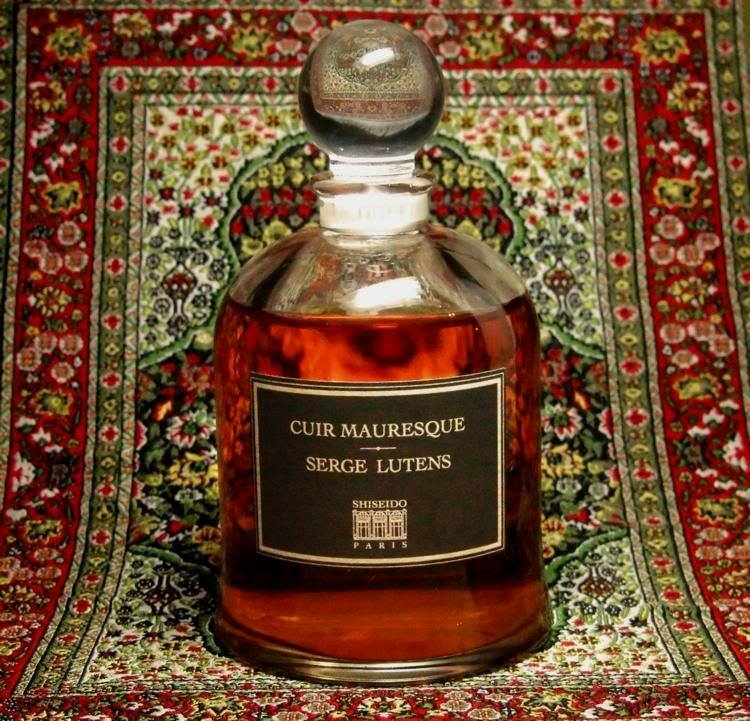 WHAT I SMELL: Cuir Mauresque opens oddly sweet and tangy, like soured candy sprinkled in sugar and it’s as if that layer of sweet rests on an orange like plastic. Actually, more precisely, this smells like something sealed in plastic that when the seal is broken, the chemical plastic odors that were trapped inside are released. After a few minutes, a sour note appears, like ripened apricot. After a few more minutes, the leather starts to appear. It’s rather faint and not harsh, but there is a sharp edge to it that makes the back of my tongue curl. After another five minutes or so, the jasmine takes center stage and the fragrance begins to bloom and thankfully, that helps to push out the sour. Unfortunately, the sour is pushed out but the sweet comes on very strong. It keeps building and it smells artificial and manufactured. Thankfully, after around the 30 minute mark, Cuir Mauresque becomes slightly more muted, but not enough to make me love it more. Cuir Mauresque (Moorish leather) is a perfume launched in 1996. It represents a blend of leather wrapped up in jasmine and sweet spices to make a true Arabian aroma. Notes: amber, myrrh, burnt styrax, incense, cinnamon, aloe wood, cedar, civet, nutmeg, clove, cumin, musk, mandarin peel and orange blossom. When I typed in “floral candy” in Google Images, this is what came up. I had to use it as her top, the headband and the cotton candy just somehow aren’t quite right, just like the fragrance. WHAT IT SMELLS LIKE TO ME: Floral candy. BOTTOM LINE: This is one of the Serge Lutens that you don’t hear much about and if it wasn’t for the wonderful Kafkaesque I probably wouldn’t have bothered to check it out. Unfortunately, this one wasn’t meant for me. In the end, it evens out, but this is one odd duck that I can do without. Categories: Serge Lutens | Tags: 2 bones, Cuir Mauresque, EDP, fragrance, leather, Perfume, review, Serge Lutens | Permalink. I guess we know why you don’t hear much about this one. I love the photo. She’s a bit of an odd duck too I’d say. I love Google Images. You never know what prize you’ll find. LOL…I felt exactly the same way! Cuir Mauresque wasn’t for me either but I remember it being harsh. It’s funny that people get polar opposite results from this fragrance. Sometimes there’s a slight variation, but these seems to go down two distinct roads! I find it very comforting with just a hint of leather, quite sweet but with a dusty texture and I cannot say that I get the sour connotations. In my mind Cuir Mauresque stands in the middle of a three step staircase. The first step is Etro Gomma: same idea, more transparent, smells like the red erasers I used when I was at elementary school. Then comes Cuir Mauresque. And in the end Knize Ten, with the leather qualities amped to a max. But essentially I can see the same idea developing through these three fragrances. Christos, I consider this a case of “when bad things happen to good people.” You and others love this, but for some reason my body chemistry rejected this wholeheartedly. I never got the red eraser effect…although plastic yes. I think I would have preferred the red erasers! I found a research paper published after a collaborative of three anthropology departments that claims that people choose perfume that smells better in combination with their natural odor and not independently of skin chemistry and this interaction is perceived by independent observation. Go figure… Apparently your skin doesn’t work well with CM..